That could be the beginning and end of my review because that was a phrase uttered by me all through this movie. As the culmination of the entire Marvel Cinematic Universe from IRON MAN all the way up to BLACK PANTHER this movie was damn near perfect. Just the scope alone of gathering all of these characters (and actors!) into one movie that never feels over-stuffed, or feels like any one character is being given short shrift. And most successful of all: that the movie works on an emotional level just as well as it does as a big budget spectacle. The Russo Brothers deserve all the kudos a person can muster up for how seamlessly they managed this beast of a project. The events of the movie itself are pretty darn mind-blowing! Heroes die, civilizations are wiped out and Thanos is presented as the overwhelming force of malevolence that I had never felt from him in any of his brief appearances throughout the various cameos the character made in previous Marvel movies. And the longtime comic book fan in me loved seeing how the movie established the core storytelling style of the superhero team books that I fell in love with as a kid. In those books a big time emergency would happen and the heroes would gather in smaller groups to deal with specific threats before coming together in the end to do battle with the Big Bad and save the day. So in that vein we got interesting team-ups of characters who we had never seen working together before that all ended up being amazing to watch. Since this is only part one of a bigger story we didn’t get the “coming together” moment from the comics yet but you can tell it’s coming and I can’t wait. Also the way the movie stuck to the themes of the comic series that inspired this story (Infinity Gauntlet…it’s a great book that is well worth the read) right up to the jaw-dropping ending. My only real problem with INFINITY WAR is with Thanos. Actually it’s just 2 things about the otherwise great character that stuck in my craw: his motivation and Josh Brolin. Thanos’ big desire is to bring order to the universe by wiping out half of the people that inhabit it. How that is supposed to bring order is a mystery to me though and Infinity War doesn’t do a good job of explaining it. Not even flashbacks to Thanos putting his population control idea into motion on a planet by planet basis did much to illuminate things for me either. It’s like the guy is a big, angry purple demographer and that motivation didn’t work for me especially not when the character has a pretty freaking cool motivation in the comics that would have been so much better if used. 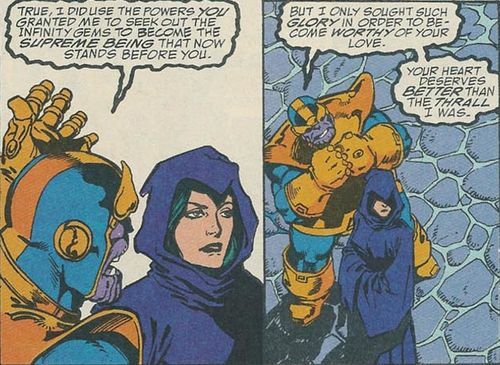 In the comics, Thanos is in love with Death (in the comics Death is a character and she’s a woman) and to show his love, Thanos wants to wipe out half of the universe. That is motivation that is simple to understand as well as being scary as hell. The movie could have kept the death obsession without even going into the physical manifestation of death like the comic does. My other issue with Thanos is Josh Brolin. I did not understand why he was hired to be the voice of Thanos because in all the time I have been watching Brolin as an actor his voice has never stood out to me as special in any way at all. It also struck me as bizarre that in a world where Keith David exists that Josh Brolin would be hired to voice Thanos. And my reservations were confirmed in INFINITY WAR because Brolin’s Thanos came off sounding more like a Michigan public school metal shop teacher than he did an evil alien mastermind. That ending though. No one was ready for that ending. Final Verdict: A massive movie that brings the epic nature of an event comic to the big screen in the most perfect way possible. This is a first chapter of a larger story that is totally fulfilling as a self-contained story while still leaving you hungry for what comes next. I plan on seeing it again this weekend too (hopefully in IMAX). And giving Thanos the Death motivation would have been so cool and now that magic is a legit part of the MCU they could have even used Lady Death herself.